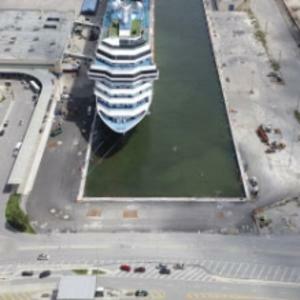 BROWARD COUNTY, FL - Larger cruise ships as long as 1,100 feet can now dock at Broward County&apos;s Port Everglades Cruise Terminal 4 without extending into the Intracoastal Waterway. The $18-million Slip 2 construction project, adjacent to the recently renovated Cruise Terminal 4, lengthened the slip by 225 feet from the original 900 feet. The total 1,125-foot slip length meets the needs of most of today&apos;s modern cruise ships such as Holland America Line&apos;s Pinnacle-class ships, which were introduced at Port Everglades during the 2017 cruise season with the U.S. debut of the ms Konningsdam or Princess Cruises&apos; Royal-class ships, which also homeport at Port Everglades. Carnival Cruise Line is currently the primary user of the newly extended berth. The Port Everglades Department is a self-supporting Enterprise Fund of Broward County, Florida government that does not rely on local tax dollars for operations. No local taxes were used for the Slip 2 extension project. The total value of economic activity related to Port Everglades is nearly $30 billion. Each cruise ship call at Port Everglades generates an estimated $2.2 million in business revenue for the local community. Port Everglades is consistently ranked as one of the three busiest cruise ports in the world with more than 3.8 million passengers in fiscal year 2016 (October 1, 2015 through September 30, 2016). Ten cruise lines, one ferry service and more than 40 cruise ships sail from the South Florida seaport including: Balearia&apos;s Bahamas Express (ferry), Carnival Cruise Line, Celebrity Cruises, Costa Cruises, Crystal Cruises, Cunard Line, Holland America Line, Pearl Seas Cruises, Princess Cruises, Royal Caribbean International, and Silversea Cruises. The Port&apos;s wide-ranging fleet of cruise ships provides guests with an array of cruise vacation choices from the Fort Lauderdale, Hollywood and Dania Beach area. View details on the latest cruise offerings at porteverglades.net or contact us by emailing PortEverglades@broward.org.